oss the entrance of the garage to ensure the goods inside remain safe from criminals looking for rich pickings. For homeowners looking to maximise the storage potential with the home then this is where a roller garage door comes in. The tough door curtain will easily protect your belongings thanks to the simplistic but effective design. Due to the fact that a roller door lifts vertically within side guides, the door is very difficult to break through. To increase the security, the bottom of the door features a reinforced bottom rail that is designed to resist anyone trying to force the door from the bottom. Coupled with a strong locking mechanism, the effort required to break through a door of this type often means that thieves will simply not bother to target your home and move on to an easier target. Along with this simplistic vertical lift design come a whole host of other benefits. 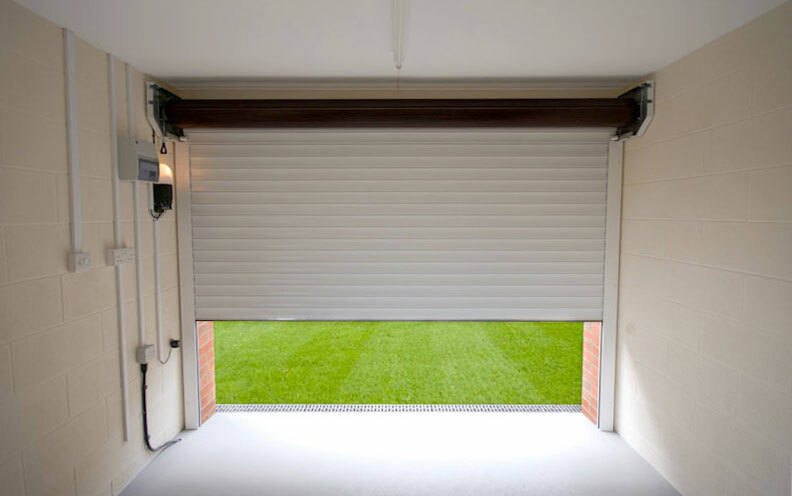 This is because unlike other forms of garage door, the curtain of a roller door coils around a compact drum wheel as the door rises within the opening. The door roll simply sits inside the garage space behind the lintel meaning that additional ceiling space can be created in which to store items like ladders, bikes or anything that may be suited to being stored in such a position. Compare this to a traditional one piece canopy door that retracts back inside the garage and it is obvious to see the benefits in terms of storage space. The other drawback to an up and over door is that as the door opens, the bottom will swing out somewhat as the door lifts. This means that parking the car very close to the door is out of the question otherwise access inside might become difficult. A roller garage door in comparison allows for cars to be parked virtually touching the door without access becoming restricted. This makes them the ideal solution for home where the driveway is fairly short or for instances where the garage opens directly onto the street. Generally available in either single skin or insulated variation, a roller garage door is available to suit all property types and budgets. With prices starting from around £300 they offer a cost effective security solution. So in addition to creating additional storage space, adding security, you can now even specify a garage door that will provide additional levels of insulation to you home that will in turn lead to long terms savings off expensive energy bills. And let`s face it, in this economic climate, every little saving that can be made to household expenses can only be a good thing. When looking to purchase a new door, the best place to compare prices it on the internet. Here you will find a wide range of roller garage doors online from a wide range of leading manufacturers for much less than you may first imagine.